So, while I’m outside cutting and sewing on the patio (and letting the kids enjoy one of their last days of summer vacation outdoors) I’m going to post a tutorial that I shared awhile ago over on Riley Blake’s Blog. Hello Riley Blake Fans! 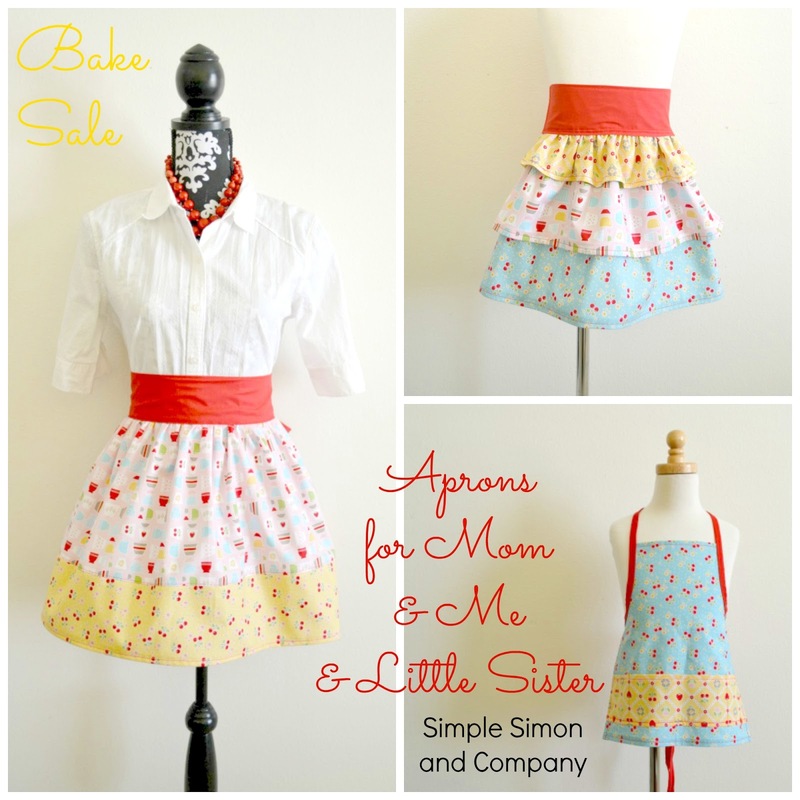 It’s liZ again from over at Simon and Company and today I’m excited to be sharing an apron tutorial with all of you. 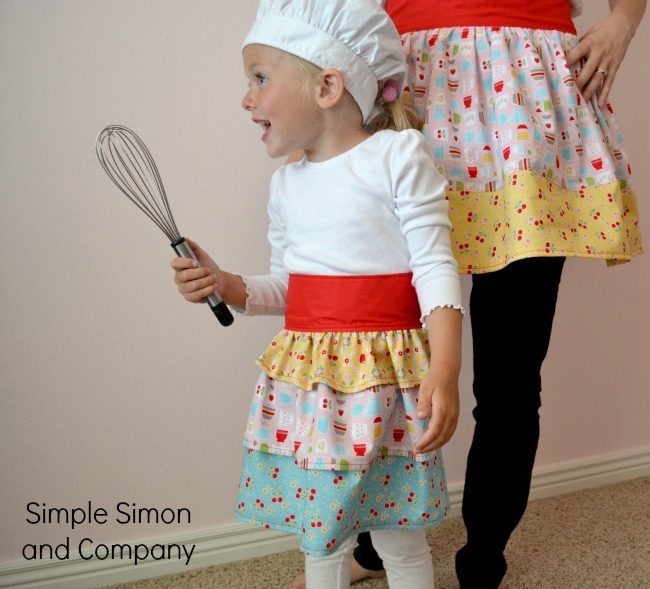 When I first saw the Bake Sale line of fabric I immediately knew that I wanted to make my girls and I matching aprons from it. (It’s just so dang cute!) And this month I finally got my chance! 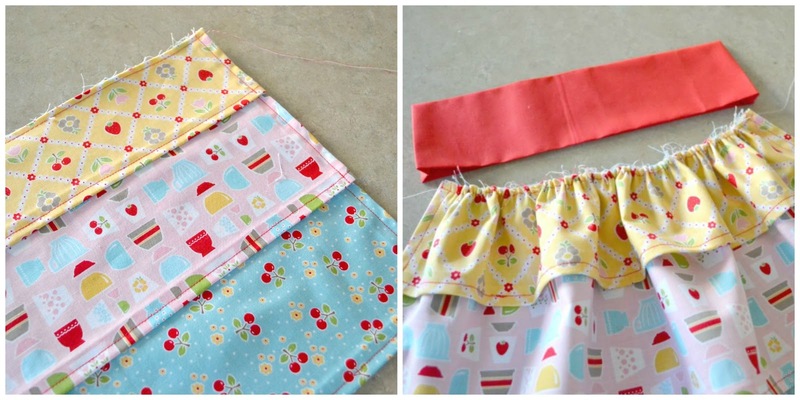 The first apron I made was for my 5 year old Gracie and that is the tutorial that I will be sharing today. It was simple and fun to make (and should fit a girl size 4-5…which is what Gracie is). 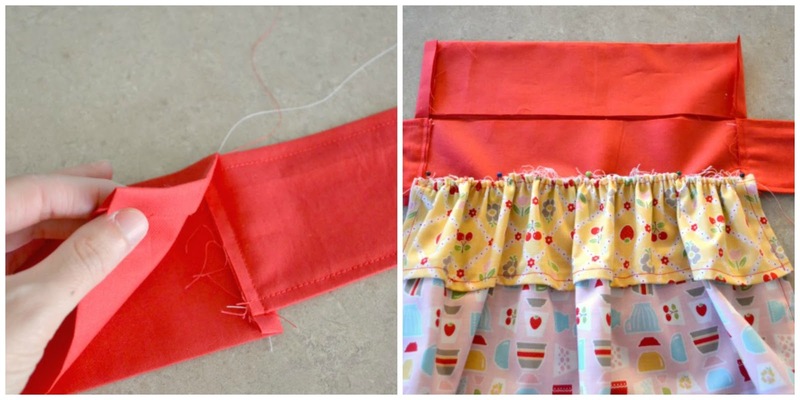 To make one for your little one the first thing you’ll need to do is cut your fabric. Now lets make the layers of our apron. For each layer fold up the bottom hem 1/4 inch and iron. Then fold it up another 1/4 inch iron and top stitch. Next repeat this process on each end. 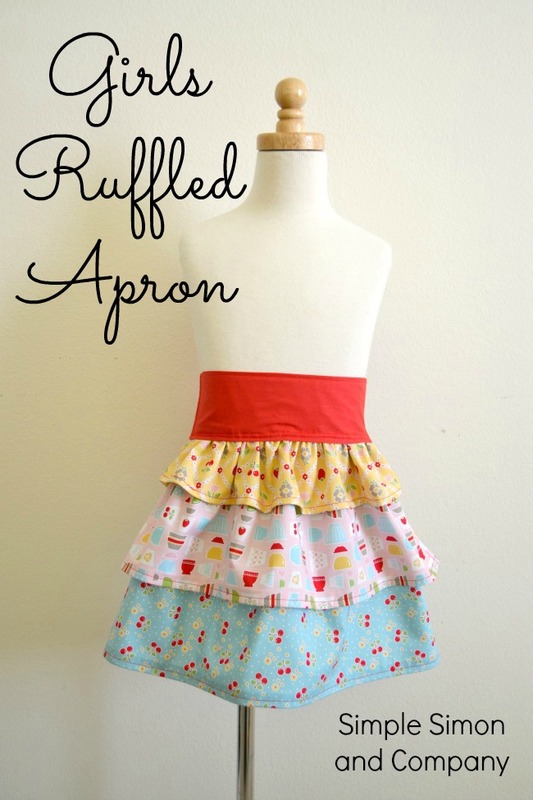 Do this to each layer of the apron. Once you are finished put your layers one on top of each other and run a long gathering stitch along the top. 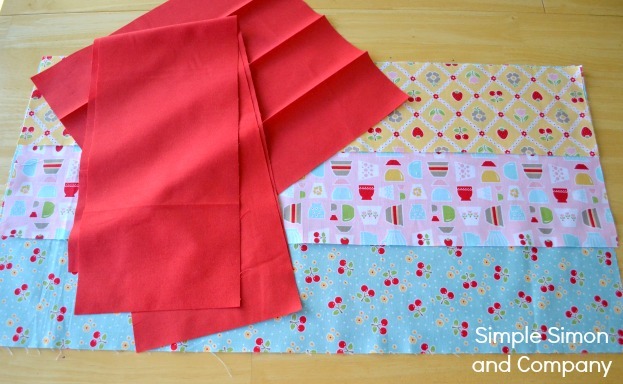 Next gather your apron layers until they are the same width as your waistband. Now let’s make our ties. Fold each tie in half length wise with right sides together and sew the edges together. Then flip each tie right sides out and iron. Next fold in the ends 1/4 and inch and iron. And finally finish up your ties by top stitching around all the edges. All that is left now is to put it all together. So place the raw edges of each tie just inside your waistband and baste onto the back side. Then pin the gathered skirt inside the waistband and baste into place. Finally fold the front of the waist band down over the ties and raw edge of the skirt portion, pin into place and top stitch. And ready to get baking!!! Thanks again for letting us come and play today! 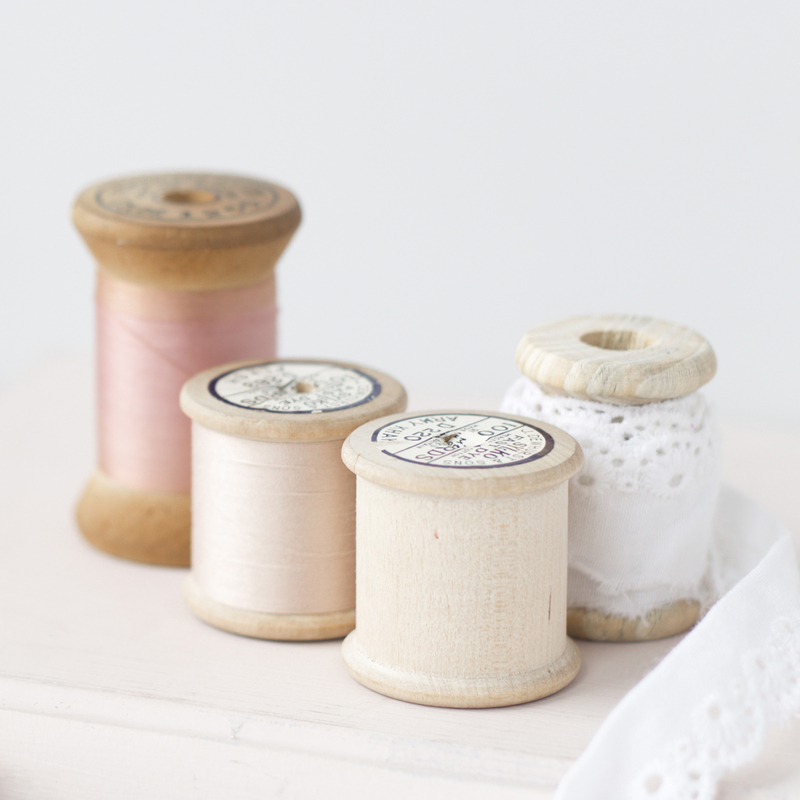 PS—Any of you out there coming to Fabric Fest or the Sewing Summit? If so, we would really like to meet you! Oh, this is so adorable! Thanks for sharing! Blessings from Bama!